The great temple of Ramses II was built between 1274 and 1244 BC, carved in the rock overlooking the Nile river. The temple is dedicated to the Egyptian gods Amun, Ra-Horakhty, and Ptah, as well as to the deified pharao Ramses II. 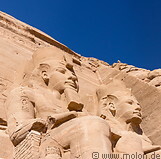 The temple facade consists of four colossal statues of Ramses II seated on thrones wearing different crowns. One of the statues was damaged by an earthquake which severed the head and torso of one of the colossi. The interior of the temple consists of a hypostyle hall with walls richly decorated with carvings.